Psalm 84:4 ... "Blessed are they that dwell in Thy house: they will be still praising Thee. Selah." GOD’s Word commands us to assemble together with the true Church that worships JESUS as GOD and honours HIS Word -- the Holy Bible. But why should the local church members gather together? And why do people stay away from church gatherings? There are many reasons: 1) perhaps we’re discouraged or distracted; 2) we may be embarrassed because we think our faith is not working as it should; 3) we may be depressed or think everyone else is succeeding but us; 4) we may be ashamed because we’re struggling with certain problems or sinful behavior; 5) perhaps were just being selfish and seeking only our will, instead of God’s. When these vital moments of decision come, it is essential to understand that if Satan can isolate you from other believers, particularly when you need them most, he’ll rob you of God’s deliverance and blessing! Sure you can stay home and read your Bible and turn on Christian television. But that’s not the same as being surrounded by your spiritual family. You will get answers, if you obey God! You’ll receive encouragement and wisdom. You’ll receive that which you cannot find anywhere else! We praise GOD together. We study and apply God's Word. We listen to one another. We encourage one another. God’s presence is ministered to one another through each one of us in the Body of Christ. Our prayers remind us that our love must always focus on our Heavenly Father and HIS word, HIS will, and HIS way. The Living Word causes us to be filled with the Holy Spirit and equips us to take advantage of opportunities to communicate with unbelievers. Time in God's Word fills us with the Holy Spirit, as we trust Jesus enough to obey it like the apostles and others on the day of Pentecost (Acts 2:14-41). Enjoy rich fellowship together in Jesus Christ. "Love one another"—John 13:3; 15:12, 17; Romans 13:8; I Peter 1:22; I John 3:11, 23; 4:7, 11. In honor preferring one another—Romans 12:10. Don’t judge one another—Romans 14:13. Salute one another—Romans 16:16 (“salute” means “to draw to one’s self, to receive joyfully, welcome,” even “retarding” one’s own journey to do so). Greet one another—I Corinthians 16:20, II Corinthians 13:12, I Peter 5:14. Don’t provoke one another or envy one another—Galatians 5:26. Bear one another’s burdens—Galatians 6:2. Forbear one another in love—Ephesians 4:2, Colossians 3:13. Forgive one another—Ephesians 4:32, Colossians 3:13. Teach and admonish one another with song—Colossians 3:16. Comfort one another—I Thessalonians 4:18. Edify one another—I Thessalonians 5:11. Exhort one another— Hebrews 3:13; 10:25. Consider one another to provoke unto love and good works—Hebrews 10:24. Wash one another’s feet—John 13:14. 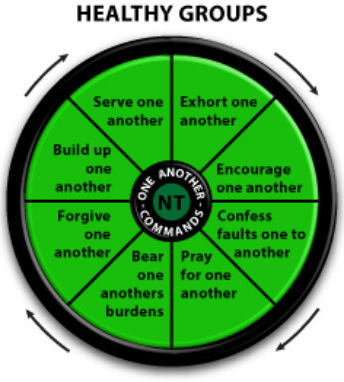 The large or small group is not about one person. It’s about everyone ministering in an environment that maximizes the "priesthood of all believers." Sabbath or Sunday Worship? See "Pastor's Blog"